Alaskans can expect something of a sequel to last year's winter weather, colder in Southcentral and Southeast but relatively warm in much of rural Alaska where sea ice has melted, a climate scientist said Friday. Those warmer-than-normal expectations – for the Western and Arctic regions – result from big reductions in coastal sea ice in those areas, said Rick Thoman, climate science and services manager for the National Weather Service in Alaska. "Holy moly, we thought last year didn't have much sea ice in mid-November," he said Friday. "This has even less. It's really quite remarkable." Sea surface temperatures in the Gulf of Alaska near Anchorage and Southeast are about normal for this time of year, Thoman said. But not so in the Bering Sea and heading north into the Chukchi Sea off Northwest Alaska. By now, a significant part of the Chukchi should be covered in ice, he said. Instead, a "large tongue of open water" extends into the Chukchi well above Russia and Alaska. "It's quite amazing now that we're 5 1/2 weeks from the winter solstice," he said. "The sea ice is far, far below long-term normal, even in comparison to recent times," he said. A lack of sea ice along the coast has contributed to increased risk of flooding from "nondescript storms" this autumn, he said. Shores aren't shielded with sea ice to damper waves, like they used to be, he said. Over the weekend, a storm gobbled beaches and caused flooding that threatened roads and houses in the villages of Deering and Shismaref more than 500 miles northwest of Anchorage. The village of Shishmaref lost a "big chunk" of the road heading to the landfill, said Shishmaref Mayor Donna Barr. The storm wiped away or damaged about 200 feet of road, she said. Chukchi and inlet waters near Shishmaref, located on a barrier island near the Bering Strait, used to freeze in October, she said. But in recent years they haven't frozen until December or even February, helping storms deliver bigger blows, she said. Shishmaref on Tuesday asked the state for a disaster declaration. The city doesn't have funds, heavy equipment or other means to repair the road, Barr said. On Wednesday, responding to a different storm, Gov. 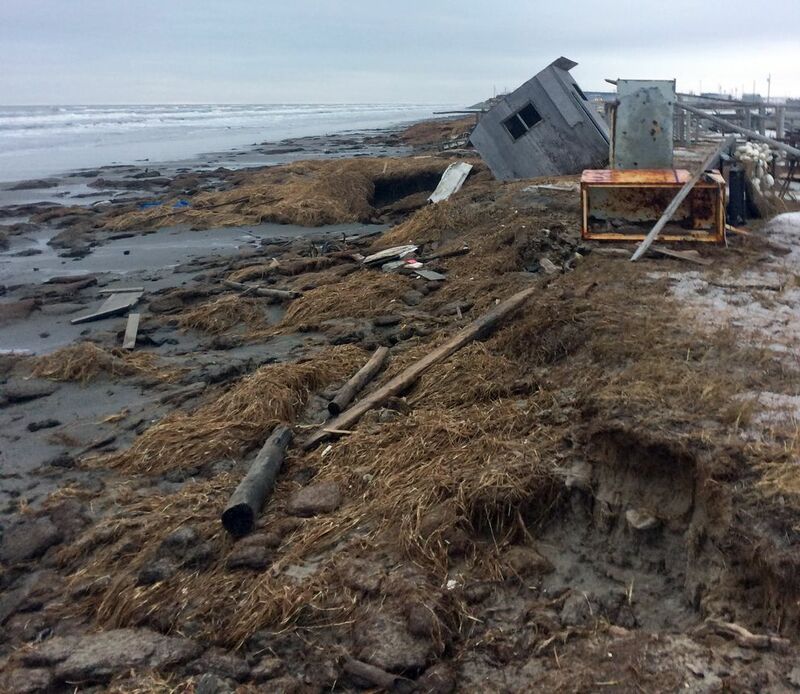 Bill Walker issued a disaster declaration for the North Slope Borough. 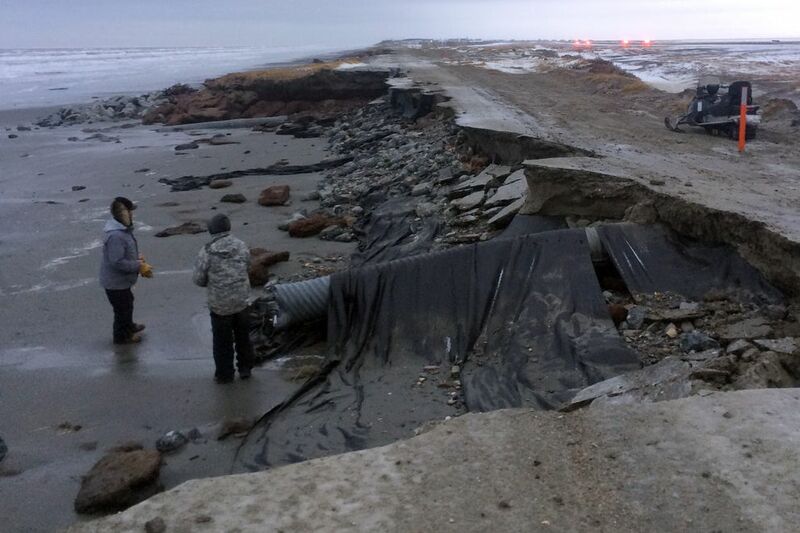 It was for a late-September storm and flooding that damaged roads and other property in the nation's northernmost city, Utqiagvik, formerly Barrow. That declaration opens up $1 million from the state's Disaster Relief Fund. On Thursday, Arctic and Western Alaska remained relatively warm for this time of year, according to a weather service map posted on Twitter. Areas around Bethel, Kotzebue and Barrow saw temperatures about 20 degrees above normal. Overall, Alaska was 4.9 degrees above the long-term average in October. The map underscored Thoman's winter expectations for Alaska. Temperatures Thursday were generally cooler than normal in Southcentral and Southeast. Those regions should "tilt cool" for the winter, Thoman said. Driving those chilly predictions are increasing expectations for a repeat of last year's La Nina, an oceanic pattern of cooling. The signs include equatorial surface water temperatures in the eastern Pacific Ocean that have fallen below normal, he said. "It's a classic La Nina setup," Thoman said. "And we're seeing the atmosphere starting to respond to that."